Vaguely my five-year-old brain sensed that Justice had been done, and a Divine Finger pointed. Books became a passion. They’re a passion for lots of us, aren’t they? Sadly, not as much as they used to be, according to an article in The Atlantic magazine in January 2014, which reported that the number of non-book-readers had tripled since 1978. Is the American Bookworm becoming a threatened species? Fortunately not all was doom and gloom. Sifting through the statistics, the author ended on a fairly optimistic note, at least as far as the 18-to-21-year-old group of readers was concerned. …this island nation of just over 300,000 people has more writers, more books published and more books read, per head, than anywhere else in the world. Hooray! A mutated strain of the American Bookworm is alive and well among the geysers. Passionate readers, passionate writers. Which brings me nicely to the idea behind this blog, talking about things that people are passionate about. Maybe a book, maybe an author, maybe a character. Maybe a bee. Or a tomato. Or a white cube. Whatever gets me, and hopefully you, going. Before signing off, here’s an interesting footnote. 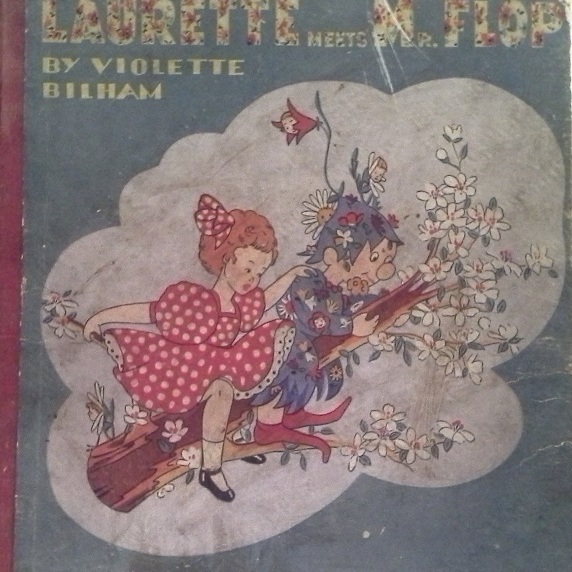 I looked up Laurette Meets Mr Flop on the Internet, naturellement. It’s out of print, but there are images of the cover that look a lot like my battered survivor. And, if you’re interested, there’s a second-hand copy for sale, for a mere €63.82. Vindication for all hoarders. My favorite book was “Heidi.” Or should I say it was the book I read the most often…..
My parents had a cabin by the river that we visited every weekend and in this cabin was exactly one book: Heidi. I read it every weekend. Don’t ask me why I never thought to bring another book with me. I didn’t! I just read Heidi, over and over….. Thanks for that comment Karen, it conjures up a lovely image of a (log? )cabin by a river and a child with her nose in a much-thumbed book – which maybe you still have? I was writing books at seven, fascinated by words in print. Among early books I loved “Bunny Blue” by Catherine Stahlmann and I still have a copy – I’m not sure whether it was my original one or a copy I bought for my children. It’s about a toy rabbit who has lost his pink ribbon, looks all over for it while his child is sleeping, and finally finds it in the toybox where he started. For older children, two of my favorites were “Understood Betsy” by Dorothy Canfield Fisher and “Nobody’s Girl” by Hector Malot. Both dealt with little girls who overcame barriers and learned strength, resilience, and the ability to assert themselves and win through. There were almost no other books at the time that portrayed young female protagonists as plucky and smart. Unfortunately I couldn’t interest either my daughter or my granddaughter in them! Hi Leslie, I have to admit I have never heard of these books, off to check with Dr Google. But it’s interesting isn’t it the fascination that animals have for us when we are small (Wind in the Willows, Beatrice Potter plus the books mentioned by other readers here). As for your pioneering little girls, do you think one reason your daughter and granddaughter weren’t interested is because a lot of the feminist battles had already been won by the time they were growing up? Maybe they just took it all for granted! Interesting to read that you were a young author, any dog-eared manuscripts lying in a drawer, hoping?? Or is all your time taken up with painting now? Oh, I didn’t see that you had replied. I think that kids aren’t interested in the books I loved because the time period no longer seems relevant and they can’t related to such a different world. Both middle-year books I mentioned were quite old-fashioned when I read them, but the subject matter transcended the time period. And yes, I do still have my chef d’oeuvres from age 7, “The Kitten Who Found A Name” and “Imaginary Girl.” They are dog-eared but still lie in a drawer…The book I wrote when I was ten or eleven, a much larger tome, I tossed when my mother was moving. Funny how we hang on to these early writings. Mine are mainly in a notepad with ruled lines and a gold-embossed grey cover, I must have thought it was the bees knees when my parents gave it to me. ‘Imaginary Girl’ sounds as if it’s about the imaginary friend that lots of kids have…? Phantom Tollbooth. Hands down. It’s the only reason why I know what a dodecahedron is. Your blog brought back some great memories, Laurette. One of my favorite books as a child was “The Story of Ferdinand,” by Munro Leaf. The illustrations by Robert Lawson of a robust, yet docile bull who wanted to smell the flowers in the fields rather than fight in a bullfight, added the perfect touch to this charming story. Oh Ferdinand the Bull! That brings back memories, what a totally captivating little chap he was. We should all take time to smell the flowers! Just discovered your blog via Goodreads and enjoy your style and sense of humor. The one book that stands out for me from my childhood is A Wrinkle in Time by Madeleine L’Engle. Why haven’t I heard of this one? Very happy memories I bet. Have you kept up the family tradition, maybe with the very same edition?? 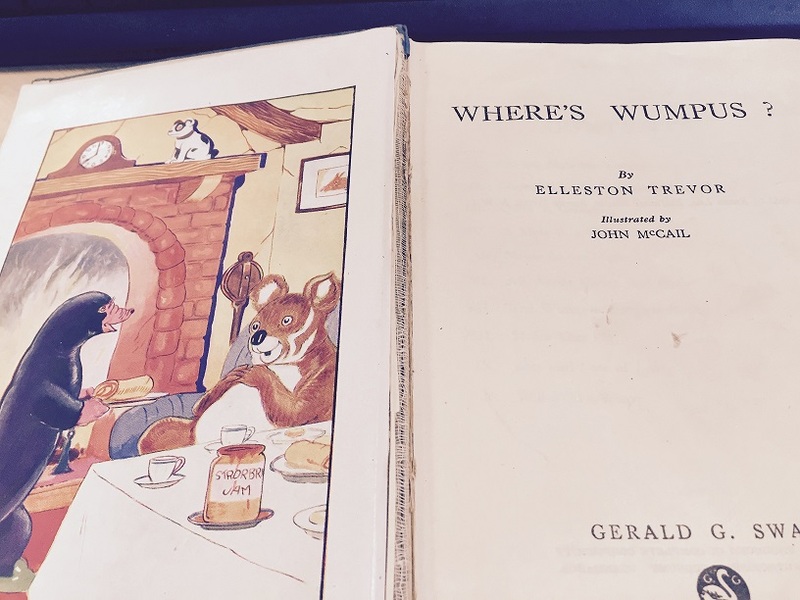 Thanks so much for sending me a picture of ‘Where’s Wumpus?’ I’ve added it to the post (I hope) so everyone can go ‘aww’. Is it still in print do you know? This was a new one for me, I remember being mad about The Famous Five. I’ve just checked it out on Dr Google, it says there’s a whole series. Do you know ‘Goodreads’, a site for readers and writers? The book (or series) has 21,203 ratings from readers! I also read that it’s being turned into a film by Sam Mendes. Can’t believe I missed this one, must have skipped straight to the Prairie! OK, heading for a download pronto. Isn’t it strange how those daily routines were subjects of total fascination? And across the generations too. I just checked out the Prairie one on Goodreads, it has 145, 742 ratings!!!! There are some fascinating comments on the site about why the books are so eternally popular. I guess I got by with a little help from my friends….many thanks!